A sad end to a victim of the bushfires in February. Australia's most loved koala will be stuffed and displayed in the Melbourne Museum following her death during surgery. 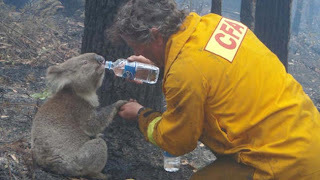 The image of Sam the koala holding hands with Country Fire Authority (CFA) firefighter David Tree and sipping from his water bottle in the aftermath of the Black Saturday bushfires was beamed around the world as a symbol of hope in the days following the disaster. 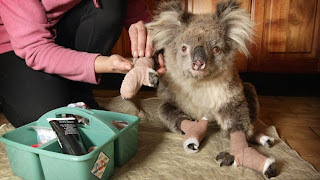 Sam's bushfire injuries had healed but the four-year-old animal was put down on Thursday during major surgery to remove cysts associated with chlamydia, a life-threatening disease that causes cervical infection and has ravaged Victoria's koala population. Victorian Premier John Brumby confirmed on Friday that Sam's carers had accepted an offer by the museum to preserve and display the koala to the public, News Ltd newspapers report. 'We will never forget the people and communities affected by those fires and we will never forget the courage and kindness of the firefighters and volunteers who helped them,' Mr Brumby said.